The Weekend Gourmet started as a way to share recipes with my family and friends…but it’s grown beyond anything I ever anticipated! I’m having such a great time, and I’ve made so many wonderful friends through the food blogging community. I’m happy that I have readers from all across the United States…and the rest of the world too! However, I recently decided to add a monthly feature specifically for my Texas-based readers….not that the rest of you won’t enjoy these posts, though! I live in San Antonio, which is in the middle of the state and 70 miles from the capital of Austin. Between these two cities, along Interstate 35, there are some fantastic restaurants. San Antonio is a big tourist destination, so I’m adding a monthly post spotlighting a local restaurant. I’m going to include the entire SA-Austin Corridor in my definition of “local.” Today is my first post in this series. San Antonio is known for its great Mexican food…we have everything from small neighborhood taquerias to national chains…and everything in between. 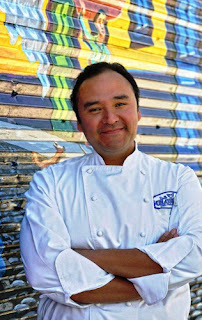 However, La Gloria Ice House is unique in that it serves street foods typically found in interior Mexico. That is quite different from the Tex-Mex food that is prevalent in Texas. I visited La Gloria recently and sat down with Executive Chef Johnny Hernandez (pictured on the right) to sample some of his signature dishes and talk with him about La Gloria’s concept. 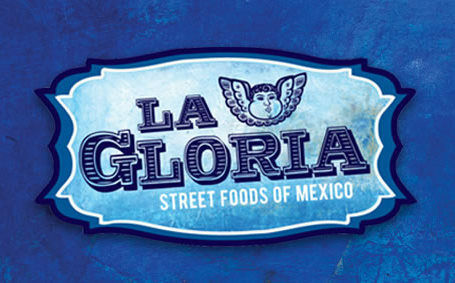 La Gloria is located at the Pearl Brewery, near Downtown, on a new extension of the famous Riverwalk. Pearly Brewery is a fun entertainment complex that features restaurants, a branch of the Culinary Institute of America, a weekly farmers market, and some fun shops. 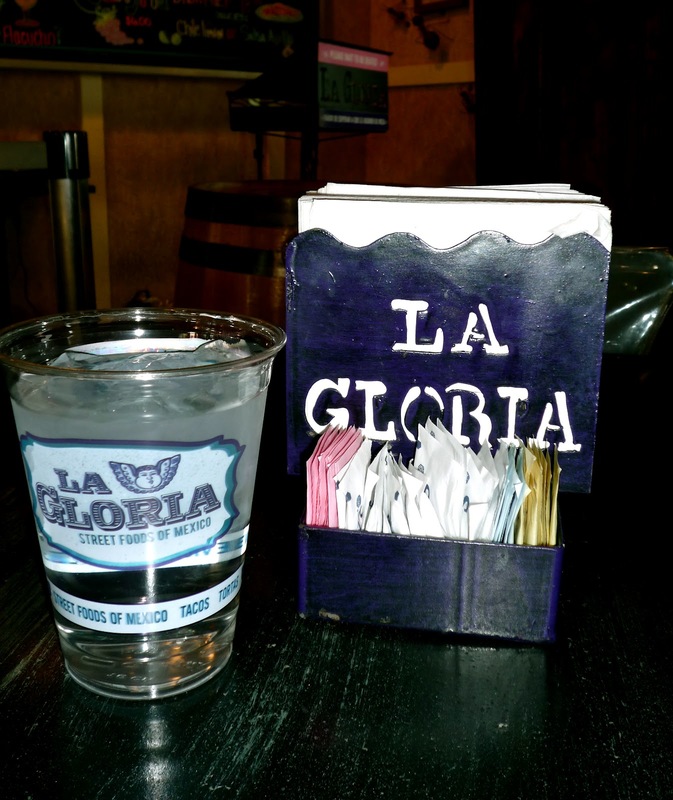 It’s a great destination, and La Gloria is part of the fun vibe! When you enter, lively music is playing…and a mixture of tourists and locals are enjoying drinks and food. The extensive menu features mostly small plates: tacos, tortas (sandwiches), sopes, panuchos, and some wonderful cocktails. It’s a fun place to visit with friends, order several items from the menu, and share over lots of laughs!! Top picture: the exterior of La Gloria...before you even walk inside, you know you're in for a good time! Bottom picture: the day's menu is printed on a large chalkboard near the entrance. They offer wonderful cocktails, as well as Mexican agua fresca (fresh juice drinks). When I introduced myself, a friendly member of the wait staff welcomed me with a big smile and seated me right away. As I looked over the menu and snapped a few pictures, the waitress brought me a glass of ice water. Shortly after that, she brought me a cast iron griddle filled with piping hot queso fundido -- melted cheese topped with roasted poblano peppers and chorizo. The queso fundido was served with plenty of hot, homemade tortillas. I rolled some of the gooey cheese into a tortilla and was in heaven! What's not to love? Melted cheese, spicy peppers, and a bit of chorizo in every bite. I've eaten lots of queso fundido over the years, but this was one of the best I've ever tasted. Queso fundido...melted Mexican cheeses topped with roasted poblano peppers and Mexican chorizo sausage. To eat, you place some of the gooey cheese into a warm flour torilla, roll up, and enjoy! It can get messy, but that's half the fun!!! About that time, Chef Johnny came to my table and sat down for a chat. He was very friendly and welcoming...and rightfully proud of La Gloria, which he opened in 2010. He has traveled extensively in Mexico, learning about the foods eaten in the different areas in Mexico. He opened La Gloria to share these dishes. As we chatted, a sampler of three ceviches and fresh tortilla chips arrived at the table: Ceviche Verde (marinated fish, avocado, tomatillos, and manzilla olives), Ceviche Veracruzano (marinated fish, lime juice, olive oil, tomatoes, and onions), and Ceviche Nayarit (marinated shrimp, cucumber, red onion, and serrano peppers). All three were tasty, but the shrimp ceviche was my favorite. It was tart from the lime juice, with a touch of heat from the peppers. Until last summer, I had never tasted ceviche…now I love it! Ceviche Sampler (from top left): Ceviche Verde, Ceviche Veracruzano, and Ceviche Estilo Nayarit. The sampler was served with fresh avocado and hot, crispy tortilla chips. Rather than order from the menu, I let Chef Johnny share his favorite dishes with me. He did not disappoint! Next came a plate with two of items that you don’t typically see in San Antonio: panuchos, which are gorditas made with corn masa that is split and filled with black beans, then topped with a variety of ingredients. The Panucho Aguacate was topped with guacamole, and the Panucho Cochinita Pibil was topped with slow-roased pork that had been marinated in citrus juices. The guacamole was creamy and good, and the pork? It was perfectly spiced and fall-apart tender! Both panuchos were topped with pickled purple onions that were made in house. Panuchos: corn masa filled with black beans. The one on top is topped with cochinita pibil (shredded roasted pork) and pickled red onions. The bottom one is topped with simple guacamole and pickled onions. Next came two tacos from the menu: Dorados de Pollo Verde (crispy chicken tacos topped with tomatillo salsa, queso fresco, and crema) and Tacos Potosinos (rolled tortillas in chile pasilla with queso fresco, with pan-fried carrots and potatoes. It was a nice combination: one taco was crispy, and the other was a soft vegetarian taco. The Potosinos was so unique…the flavor of the complex chile sauce reminded me a bit of mole. La Gloria offers several vegetarian options on their menu, so everyone can come and have a good time! Two kinds of tacos from the menu...Dorados de Pollo Verde (left) and Tacos Potosinos (right). One crispy, one soft...one chicken, one vegetarian. Both? Wonderful! I was getting pretty full by then, but I saved thismuch room for dessert…I asked Chef Johnny to bring me his personal favorite. A few minutes later, out came a gorgeous Flan de Cajeta. Cajeta is a caramel traditionally made with goat's milk. The flan was out of this world! It wasn’t overly sweet, and the texture was sublime…super creamy without being overly rich. I was full, but I couldn’t stop eating it!! Make sure to save room for dessert...this gorgeous Flan de Cajeta is creamy goodness! By then, it was time for me to say "no mas"...I was totally stuffed from all the wonderful dishes that I tasted during my visit! I thanked Chef Johnny for his hospitality and told him how much I enjoyed the food. The extensive menu at La Gloria offers something for everyone: mild to spicy, seafood, meat, and vegetarian. The portions served are the perfect size for sharing with friends and having a good time...and the prices are very reasonable. Most menu items are priced well below $10. La Gloria has a huge outdoor area located in the back of the restaurant, where children can run around and play while the adults enjoy their meal and keep a watchful eye on them out the window. The night I was there, the crowd was a good mix of couples, professionals just off work looking to unwind, and a few families. I love places that have a casual, fun vibe…but offer really great food. Sometimes you have to compromise one to have the other…but that’s definitely not the case at La Gloria! I can't wait to go back and sample more of their menu items!! If you find yourself in San Antonio, I hope you'll stop in to sample some of their fun menu items.